This radio play, starring Orson Welles as Captain Bligh, was broadcast via the Campbell Playhouse on January 13, 1939. Set adrift in a small boat, with non-mutineers, Captain Bligh and his crew reached East Timor - and safety - after being at sea 47 days. They had traveled 3,618 nautical miles (6,701 km). 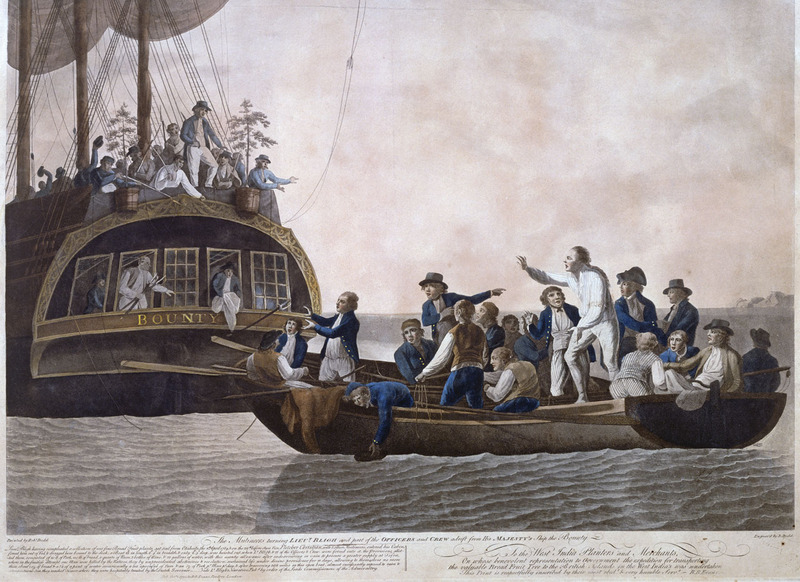 Bligh survived the ordeal, returned to England, reported the mutiny and testified about it (in a court martial which examined why the Bounty was lost). He was aquitted of any wrong-doing. ...there were men to whom he did not wish to be kind, and dogmatic judgments which he felt himself entitled to make; he saw fools about him too easily, and the thin-skinned vanity that was his curse through life was already with him ... Bligh learnt a good deal from Cook: he never learnt that you do not make friends of men by insulting them. (The Life of Captain James Cook, by J. C. Beaglehole, page 498). In 1792, Bligh published an account of the mutiny, entitled A Voyage to the South Sea. This map depicts Bounty's route of travel during her last voyage (with solid blue as the path of the journey before the mutiny and dotted-blue as the path followed by Fletcher Christian after he took control of the ship). Also included is the journey (depicted in dotted green) of Bligh and his men as they made their way to Timor. Campbell Playhouse broadcast of Mutiny on the Bounty, as dramatized and produced by Orson Welles and his Mercury-Theatre-on-the-Air colleagues. Radio broadcast originally aired on January 13, 1939. Clip online, courtesy Archive.org. Bos, Carole "Mutiny on the Bounty - Campbell Playhouse" AwesomeStories.com. Oct 07, 2013. Apr 19, 2019.